The AWI Journal recently published “Of Counsel, Freelance and Other Lawyer Relationships” authored by Laurie Rowen and Erin Giglia. The AWI Journal is a peer-reviewed professional journal on workplace investigations, and each article is reviewed by at least three members of the Publications Committee or other subject-matter experts selected by that committee. Montage’s article focuses on what law firms should know when engaging outside lawyers to assist with a firm’s legal work. Whether the outside lawyer is an “of counsel” lawyer, a freelance or contract lawyer, or the entire matter is referred to a different law firm, multiple ethical rules come into play. The article cites to California ethical rules, American Bar Association Formal Opinions, and local California Bar association opinions, to come to various conclusions regarding when an “of counsel” designation should be used and certain burdens associated with the designation. It also highlights commonly misunderstood ethical rules including (1) Aiding and Abetting the Unauthorized Practice of Law; (2) Fees to Client/Upcharging; and (3) the Duty to Disclose. Montage Legal Group’s founders are frequent commentators on freelance attorney and contract attorney ethics. 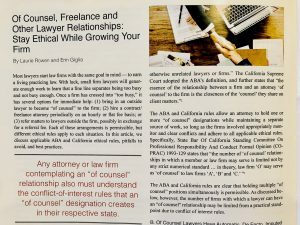 In July 2017, Laurie and Erin published a similar article in the ABA’s Law Practice Today on the ethics of freelance and of counsel relationships. In May 2017, Laurie and Erin spoke for the OCBA on “Ethics of Growing Your Practice: Use of Contract Attorneys, Referrals and Associations.” In June 2017, Erin was quoted in, “Where Should Firms Draw Line on Contract Lawyers,” by Miriam Rozen, The American Lawyer (June 9, 2017), discussing freelance attorney rates and fees. Various publications frequently reference their article, “Ethics of Contract Lawyering” (Part 1 and Part 2), Law.com-The Recorder (April, 2013). To read additional publications by Montage’s owners and freelance lawyers, see Montage Press/Articles.